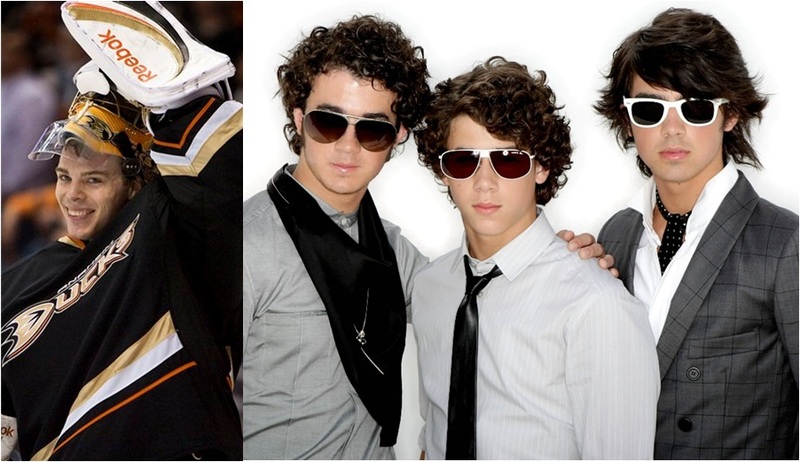 No, it wasn’t Kevin, Joe or Nick that tormented the Blackhawks on Sunday night. It was Jonas Hiller, the goaltender for the Anaheim Ducks, who did a masterful job of almost completely quieting the hottest offense in the NHL. Hiller stopped 42 of 43 shots the Blackhawks put on net, 16 of which came in a desperate third period, as the Ducks proved to be mighty in a 3-1 victory at the United Center. Just a night after the Hawks wasted an offensive explosion, they continued to look bored through much of the first two periods as the Ducks pushed to a 2-0 lead. The Blackhawks defense only let the Ducks put 12 shots on net, but three of them counted in a game. Antti Niemi allowed two of the Ducks’ six first period shots to get past him, but only had to stop five more in the game. In each of the Hawks’ last eight games, allowing only two goals would have been good enough to get Niemi a victory; on Sunday, thanks to Hiller, it wasn’t. Just as was the case in the third period in Minnesota on Saturday night, the Blackhawks passing was sloppy, the skating was slow and the puck handling was sloppy. To make matters worse, the Hawks were without one of the great one-man equalizers in the game; Marian Hossa was out of the lineup with an apparent lower-body injury. 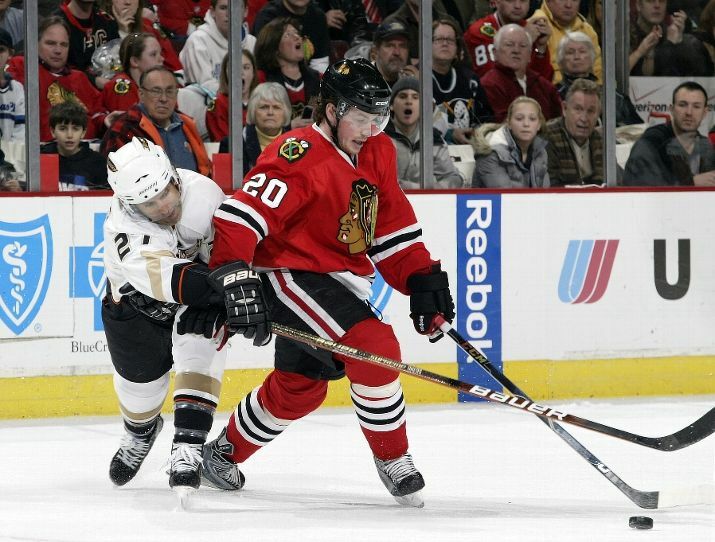 Jack Skille replaced Hossa in the lineup, but skated only nine ineffective minutes. It wasn’t until the end of the Hawks fourth power play opportunity of the night that Duncan Keith finally broke the seal on the night, getting a laser past Hiller thanks in large part to a great screen from Andrew Ladd. But with less than a minute left in the game, Keith gave the tally back with a terrible turnover in his defensive zone and with Niemi on the bench. Teemu Selanne capitalized on the empty net, and Keith rightfully slammed his stick into the empty net. In the loss a number of streaks end for the Blackhawks. The team’s streak of eight consecutive games with at least four goals is over. Patrick Kane’s personal streak of 11 games with a point is through, as is Kris Versteeg’s seven game point streak. The team also broke a four-game home winning streak, and the team’s incredible streak of killing 33 consecutive power plays at home, a streak that stretched all the way back to Nov. 15, ended with Corey Perry’s first period goal. Now begins the toughest part of this weekend’s 0-1-1 failure: the Blackhawks won’t play again until Thursday night, when they hose the Columbus Blue Jackets. That’s three days off to think about blowing a four-goal lead in the third period in Minnesota and then a flat performance against the Ducks. How the team adjusts on the ice during practice, and puts these two performances well behind them, will be big as January moves into the hardest stretch of the remaining calendar for the Hawks. After Thursday night’s game, the Blackhawks won’t play in Chicago again until Feb. 3, a stretch of 20 days. 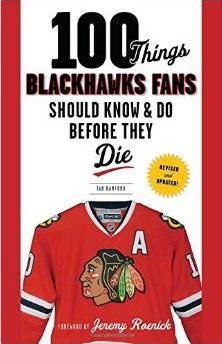 Hopefully Hossa, and the offense, shows up to play on Thursday night. Jack Skille was -1 in only nine minutes on Sunday night. Say hi to Rockford for me!